Courtesy Nicolet High School Members of F.E.A.R. (Future Engineers of American Robotics) test their robot. Now robots aren't just coming for your jobs. They're coming for your sports fantasies, too. 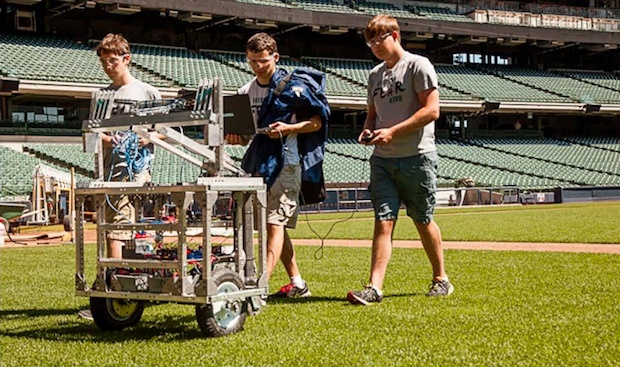 This weekend, in Milwaukee, Wisconsin, a robot built by tech-savvy high school students will throw out the first pitch at the Brewers-Cardinals game at Miller Park. In the fan-fervent heartland, where sports are everything, giving this classic honor to "Robot Yount" is an impressive symbol of the growing support for emerging innovation and the role technology is playing in job creation. Created by 26 students on Nicolet High School's robotic team, the wireless robot will throw a pneumatically-driven, electromagnetically-fired catapult -- aka a perfectly-calibrated 65 mile-per-hour pitch-- over home plate. Nicolet's robotics program is just one piece of a larger STEM program at the award-winning high school. The school, known for academic excellence and college acceptance rates, partnered with the STEM Academy to offer a new Engineering Design and Architectural Design curriculum. STEM curriculum engages students through real work experiences and creates the opportunity to acquire industry certification. Students will have the opportunity to become certified in the 3D CAD design software, SolidWorks, during the 2014-15 school year. "Student interest in STEM has never been higher," said Nicolet School District Superintendent Dr. Robert Kobylski, "We've found that students are excited by the hands-on learning STEM provides. The STEM Academy curriculum will make our students more competitive when applying to colleges and universities as well as prepare them for future employment opportunities. " Next up: Star Spangled Banner Bot?